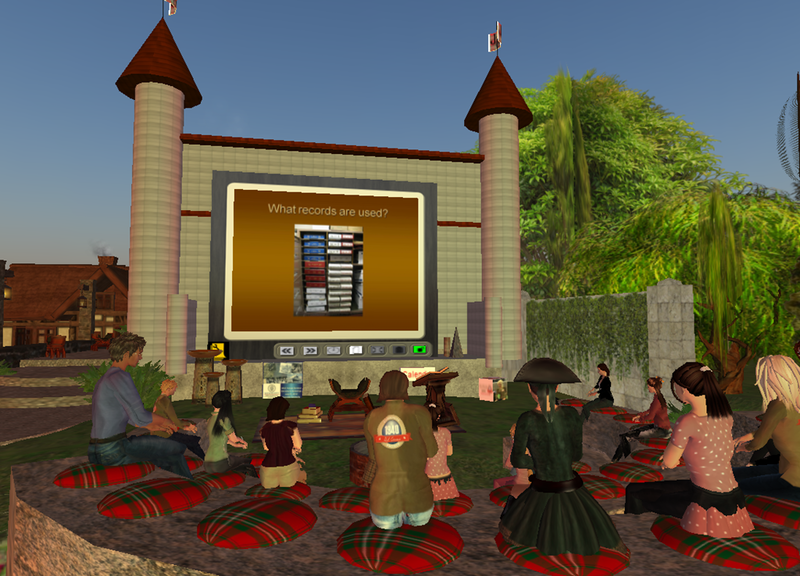 Last evening, there was a presentation at the Second Life Association of Professional Genealogist (SL-APG) by mayrumblepois. May, is her Second Life name, and I will refer to her by that name. I can only say that she IS the House Historian. Her presentation was about her passion in this line of research. She explained that WE, those around the “Fire Pit” (as seen above) have the skills to also be House Historians. The skills are very much the same, the types of records might be the same, but what we are looking for is not about People, but the physical house. The biggest difference is audience, and WHERE the research is done. “May” reminded us that her research is very local. No travel, no conferences, and it’s not ‘family’ who will receive any questions or reports based on the information gathered. I have talked to “May” in RL (Real Life) about this, and shared a story with her about a project that I had done in 2007. It was on a House, a historical one at that, and a bit of the journey that I had in a presentation that I had done on that house. I have blogged about “Montmorenci” in the past, have a continuing search for the reason for a “staircase” that is in the Maryland Montmorenci, and the discovery of another Montmorenci Staircase. That search continues, as well as some contact, based on this blog, about family members from “the other” Montmorenci. What contact was within the past month or so. The search continues. I re-looked at a book that I created, in 2007, and gave to the owners at that time, to see what it would take to really do a House History on that house, based on the presentation last night. I have notes that track the owners of that house, from the beginning, through 2007, I have notes from the surrounding area and the impact of the families who owned that house to that area (History of the area), so I might have the beginning of a House History for this specific house. In addition, the notion of researching in a “local” area, might not be true, in this case, but it would mean a visit to one or two repositories to gather the “missing” information that might be important for the history of the house, rather then the family history of the families who lived there. During the presentation, that some of these houses do have “stories” of their own. Some to be told, others, maybe not. While I have been “Looking for ….” Montmorenci, I have one of those stories. In researching that mystery, I saw a number of other stories of events that took place in that house, so I know the information is “out there”. Once again, May, “the House Historian”, I may be up to your challenge. I will blog about it here. In this Blog post: https://worthy2be.wordpress.com/2011/02/03/in-search-of-montmorenci/ I continue my search for these two staircases. Earlier, I mentioned that the 2nd staircase was located at the Winterthur Museum in Delaware. I joined there, with my daughter, so we could visit this wonderful museum and learn more about it and the staircase Its a wonderful place to visit. Wonderful new Blog. Thank you. I hope it’s OK to ask here. In the museum, you have the Montmorenci Staircase. That staircase, as I understand it, came from South Carolina from a house called Montmorenci. I have seen photos of that house and have seen a couple of brief stories. However, not an hour south of Winterthur is another Montmorenci which also has a Montmorenci Stair case. So, my question is, how come there are Two Montmorenci’s and both of those houses have similar staircases. My guess is, that the answer lies within architectural information about one or both of the houses. Did the architect or Mr duPont know of the Maryland Montmorenci. Thank you for your time an consideration and I look forward to your new Blog posts. With any luck, I’ll get back down to Winterthur this fall. I did get an answer. Perhaps not the answer I wanted, but here it is. Russ, I checked with our estate historian, and here’s what she says: The answer has to do with a coincidence of name. A French aristocrat named Montmorency commanded troops under Rochambeau in the American Revolution and became an American hero. There are many towns and houses named after him. 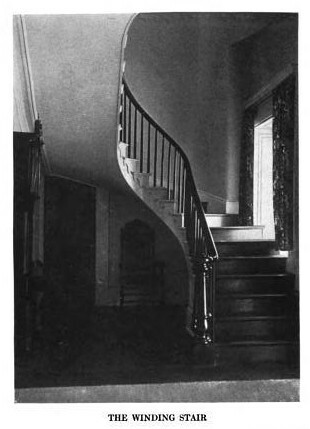 The staircase in Maryland is curved like the one from the house named Montmorenci, which was located near Shocco Springs, North Carolina, but is not free-standing. The free-standing curve is what interested du Pont. Hope this helps! So, for now, I will put my research aside for a while, as there may not have been a connection in the first place. The time for the naming of the property may be the connection, but what about the stairs. I need to make another visit to Maryland to get a better look at the staircase and to see if I can find “the rest of that story”. So, for now, back to my Civil War Hero. I have posted a couple of times that I am searching for information about Montmorenci (Maryland) and it’s staircase. During this process, I received a comment, from the Blog, from someone who I has lost contact with. During our “conversation” I was told about an event that took place at Montmorenci. Newspapers: Critical Resource to Complete Your Family Tree The speaker was Thomas Jay Kemp. Looking at the menu at the top, is Training, and Webinars. I haven’t put the link directly to the Webinar, as the recording of that Webinar will not be available after March 10, 2011. But the Legacy Family Tree Webinars have been very educational. The topic was on how to take advantage of the GenealogyBank website. Thomas said a couple of times, “don’t forget the newspapers“. (or at least that is what I heard). Thomas’ comment and that email stayed with me until the end of the Webinar. Didn’t want to miss any of his words of wisdom. Webinar over, headed over to Genealogy Bank, and look at their Historical Documents collection. Having listened about how to search, I wanted the best results, quickly. Had to find that article. What I knew was that the murder happened at Montmorenci. Of course, Worthington’s built that house and it was in the family until the early 1900’s. BUT, I didn’t want to guess that it was a Worthington. Didn’t know the name, nor date of the Murder. But, I did know that Montmorenci was in Maryland, and that it was in Baltimore County. So, I selected Maryland, and Baltimore County. Didn’t want to enter anything BUT Montmorenci in the Include in keyword search. There were a couple of pages of “hits”. I looked at the articles which confirmed some of the information that I knew about the house, property, and people who lived in that house. What a story it was (is). 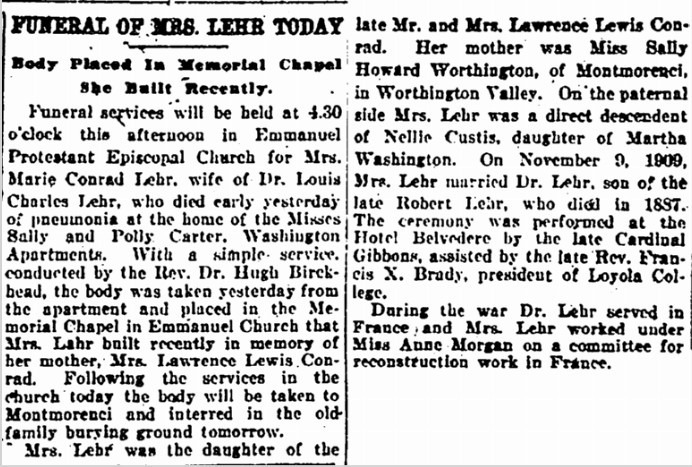 There is a lot of genealogical information in that 1883 newspaper article. Some confirming what I knew, but the level of detail of the event were outstanding. I won’t go into the details about that, but what a story. “Lawrence Lewis Conrad, a great-great nephew of George Washington …” got my attention. His wife was “Miss Minnie Worthington”. So, another branch to follow. Of course, I passed this information along to the person I was emailing. I attend a “local” Family History Interest Group (FHIG), in Bernards Township, NJ at the local library. I have been known to speak there, but it’s an hour away so I don’t always get there. The topic last night was on how to use America’s Genealogy Bank. The Reference Supervisor, Ruth Lufkin was the speaker. She gave a great presentation on the America’s Genealogy Bank, as the library uses it’s resources. She showed us (about 40 of us) how to use it, with tricks on how to use the search, what you might find. I had mentioned to Ruth, when I got there, that I had a story about my experience with Genealogy Bank. She said that she had been looking for some connection between Genealogy Bank and FHIG. As the say, “and the rest is history”. Thank you Ruth, for letting me share my story. 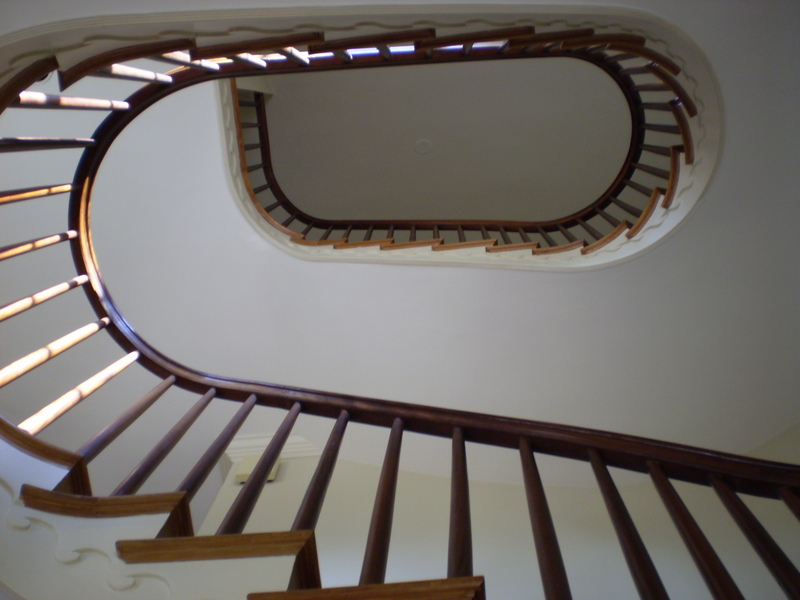 I continue to search for the links between two unique stair cases, from two houses, both named Montmorenci. He mentioned a number of times, ‘don’t forget to search the newspapers’. What a great reminder. So I did. I have only just begun to search for my mystery (or should i say mysteries) and have fond out that there are many “Montmorenci’s” around, and a couple of French nobles that have that name. A Walk in Canada, and cities / towns in South Carolina, Pennsylvania, and I am sure I’ll find more. So far, on the Maryland Montmorenci, I found a Obituary of a young child who died there, and a couple of other events that took place with names of the owners of Montmorenci. The names are known to me, but all the more reason to Not to Forget to look in the Newspapers. Thank you Legacy and Mr. Kemp. 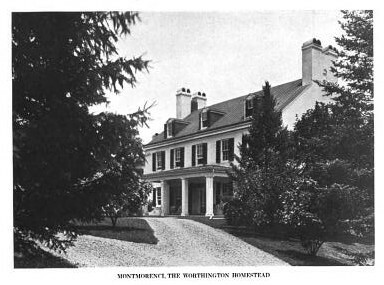 NEAR the hamlet of Glyndon, Baltimore County, Maryland, in the Worthington Valley, is to be found the old Worthington homestead, Montmorenci, built about 1760 by Samuel Worthington who married Mary Tolley. From these two a long line with many branches has descended, and from this generous old home have gone forth many sturdy sons who have played conspicuous parts among their fellows. The house is finely situated on the crest of a hill in the centre of the thousand and more acres which remain to it of the vast tracts over which it lorded when it was young, and is as sound and weatherproof to-day as when it was new. It is of stone and plaster construction, the walls being very thick and the foundations of a mass sufficient to support a battlemented tower. A winding road leads from the entrance of the grounds to the front of the house, and from the rear the ground falls sharply away to the Italian garden which the present mistress of the old home, Mrs. Mary Conrad Lehr, of Montmorenci and Washington, is devising at the foot of this declivity. The exterior of the house is plain, and there is a small wing at the north end which contains the kitchen and pantries. 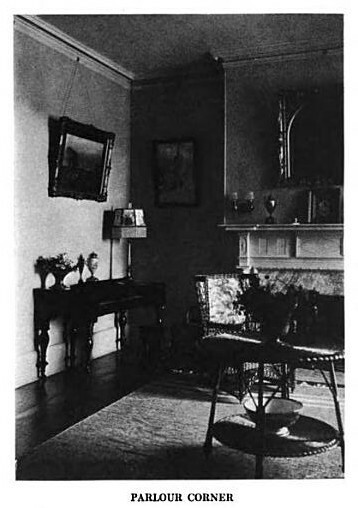 The interior arrangement of Montmorenci is like that of many another old Maryland home in that it has a broad hallway from front to back of the house, on which as an axis the other rooms are symmetrically disposed. The winding staircase, however, with its slender mahogany rail and its slim, patrician mahogany spokes, is a very graceful and unusual feature and is perhaps one of the mansion’s greatest beauties. In Montmorenci may be found a great quantity of rare old furniture which (as is not always the case) has found an appreciative mistress in the daughter of the house of this generation. It would be, perhaps, without interest to mention styles and periods well known or to attempt in any way a description of the furniture, but in each room of the house are to be found pieces to interest the lover of things colonial, and so great a quantity has Mrs. Lehr that she is able to furnish her new home in Washington from Montmorenci without seeming to have robbed that place. 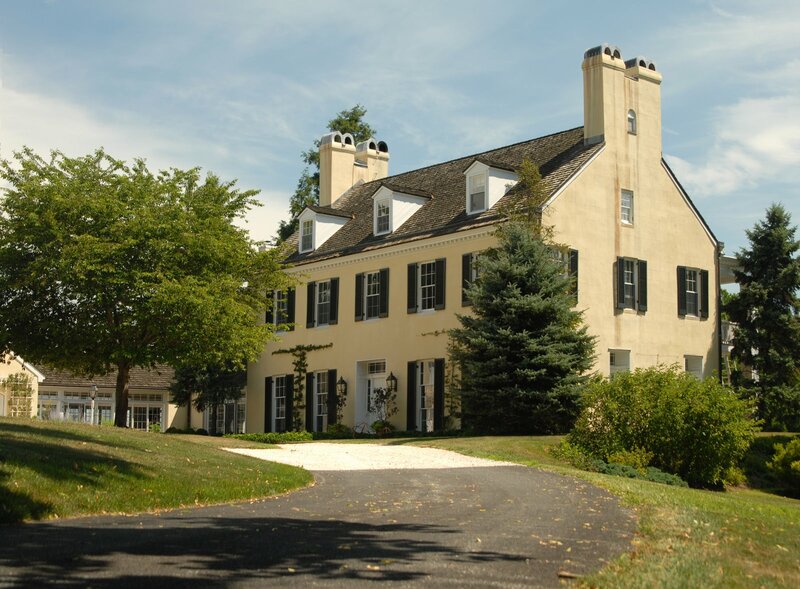 Not far from Montmorenci is Bloomfield, another old Worthington place and built by a son of the builder of Montmorenci. It is a brick homestead and is distinguished for the carving which graces the north wall of the living room on the interior. Though long a Worthington possession, it has been for a number of years the home of Mr. and Mrs. Charles Councilmann. The Worthington family has already received a brief summary in the chapter devoted to Belvoir, the beautiful mansion on the Severn in Anne Arundel County, Maryland. The tombstone of the founder of the family in Maryland, Capt. John Worthington, is to be found in a vacant field not far from Annapolis and still in good preservation. From it we learn that Captain John died in 1701. His son, John, styled “Merchant” in his will (in which he disposes of a great fortune), married Helen Hammond, daughter of Thomas Hammond and his wife, Mary Heath, and had, among other children, Samuel Worthington, who married Mary Tolley, daughter of Walter Tolley, of Joppa, Baltimore County, Maryland, and built Montmorenci. From Samuel Worthington the homestead descended through Edward, his son, to John Tolley Worthington, first, to John Tolley Worthington, second, his greatgrandson, who married Mary Govane Hood, daughter of James Hood, of Hood’s Mill, Baltimore County, Maryland. From him it descended to his daughter, Mrs. Sarah Worthington Conrad, now an invalid, whose daughter (who married Louis C. Lehr, Esq.) is the present mistress of Montmorenci. Montmorenci, In search of …. In 2007, I gave a presentation on a historical house in Maryland. This is Montmorenci as it is today. 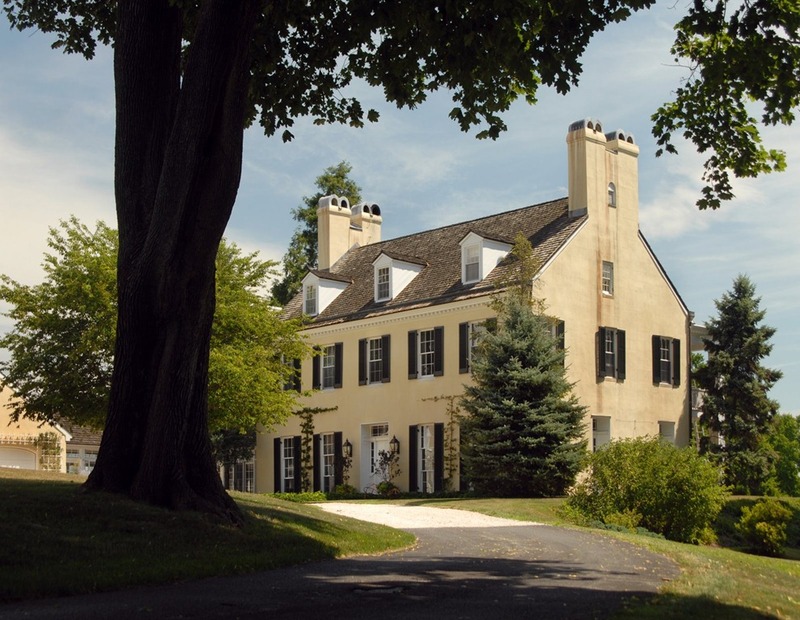 This property was part of other property purchased by John Worthington, Jr (1688-1763) in the Valley that bears his name. Worthington Valley. This property was willed to he son Samuel (1734-1815). John Worthington, Jr, was the oldest son of “Capt” John Worthington (1650-1701), my ancestor. However, I am a descendant of the youngest son, Charles Worthington. The presentation was not on the history of the house, but the story of those who lived in this house and their impact on the area. But that’s another story. This house, from my research, was in the Worthington family until about 1918. While there, I took this picture. It was a cool picture for me, at that time, and not much more. However, when I got home, I did a little research for Montmorenci and discovered that there was a Montmorenci that was in Delaware and it wasn’t this one. Fast forward to the summer of 2010, July 2nd to be exact, I answered a phone call: and blogged about that telephone call. I was introduced to that Delaware Montmorenci Staircase. The owner of the Cheyney house is a tourguide at Winterthur. This past weekend we traveled to Winterthur to see “the other staircase”. Although I grew up, not far from here, I do not remember visiting Winterthur. We took one of the tours of this 7 story mansion, now museum, of the du Pont family to see the Montmorenci Stair. As the story goes, the family was on a cruise and on their return that former marble staircase was replaced with a 360-degree turn staircase. This staircase was fashioned from an 1822 plantation home called “Montmorenci” built in Shoocco Springs, North Carolina. 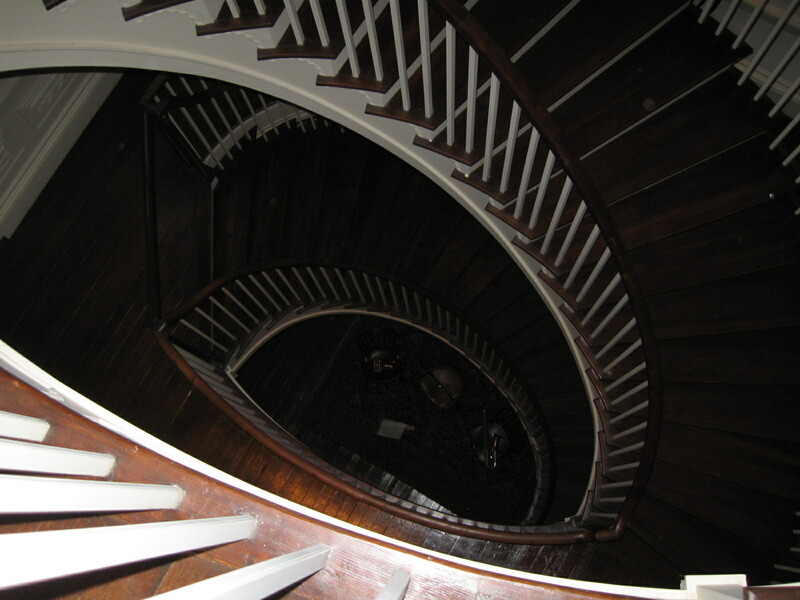 The original staircase, as was told by our tour guide, was not structurally sound to be uses, so Thomas Waterman redesigned the one-story staircase to two stories and widening the circular shape to an elliptical oval that now reaches to the ceiling or to the current 7th floor. A return visit to see this Staircase, all decorated for the Christmas holidays are in the plans. The photos at Winterthur are awesome. So now there are two questions. 1) What is behind the fact that there are two Montmorenci homes. One in Maryland and the other in North Carolina? 2) Why do both have these beautiful, might I add unique, staircases? During a slide show orientation, there is a photo of the North Carolina Plantation. Not knowing it was coming and moving quickly, I need to find a photo of that house to compare to the one on this Blog. The other side of the house, not show here, may be similar to the one in North Carolina. So, I am now “in search of” … the history of the Montmorenci Staircases.